. :: Hot Club Philly - Gypsy Jazz in Philadelphia ::. They are available for private parties, weddings, concerts, Swing dances, house concerts, workshops, etc. Contact Barry at 215-380-2588, or email; Barwarren@aol.com, for more info. Barry Wahrhaftig, the lead guitarist of the HCPhilly now has a blog, www.GypsyJazzGuitarOnline.com with Gypsy Jazz Guitar lessons, transcriptions, interviews etc. The piece was written by Stephane Wrembel for the Woody Allen film 'Midnight in Paris'. The transcription in tablature and notation. Upon purchase, it will be emailed as a pdf. One is immediately struck by the easy, but deep swing that comes out of Bob Butryn’s clarinet (he’ also a swing dancer!) on the medium-tempo first track, “Song d’Automme.” One can’t help but be taken by the way these players make so much out of so little. Two Rhythm guitars and a bass keep the time and groove with some simple but well crafted changes in a minor key, as the improvisers outline them with the most essential notes, while making beautiful and singable melodies for the listener to relate too at all times. Throughout the CD, new players come and go, such as Accordion player John Matulis for the track “La Gitane,” giving it a unique texture. This song is in a triple meter, as the bassist plays on one and the guitars on two and three, giving it a waltz vibe. I can easily visualize a dance floor in France with numerous couples brimming with life. Barry Wahrhaftig shows that he is no Django clone on this track. His right hand has a completely different approach. Undoubtedly one of the big highlights of this disc is “Someone to Watch Over Me,” sung by Denise King. She infuses plenty of personal experience in her rendering, as the song builds gradually. It begins as a duet, with the beautiful solo guitar work of Howard Alden, before the bass joins, and then the lead guitar of Wahrhaftig. “Nuages” is another nice interpretation, featuring vocalist Phyllis Chapell. Wahrhaftig takes a particularly memorable guitar solo on this track, departing from the classic gypsy vocabulary with some very unique lines, and plenty of emotion. The listener will be happy to hear Bob Butryn return for a gorgeous clarinet solo. 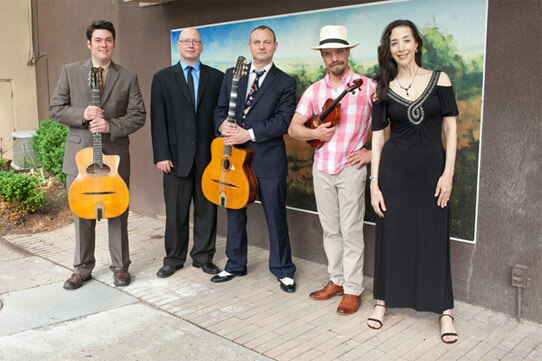 The Hot Club of Philadelphia may be dedicated to playing the music of Django Reinhardt, but as advertised, they add their own voices and mentalities into the mix, and often infuse Latin and more traditional swing styles into the mix. All of the members have impeccable chops and unwavering musicality. If you’re in the Philadelphia area, be sure to seek them out.